At the end of 2013, LinkedIn analysed the skills and employment history of more than 239 million members’ profiles asking the question, who is getting hired and what are they doing? 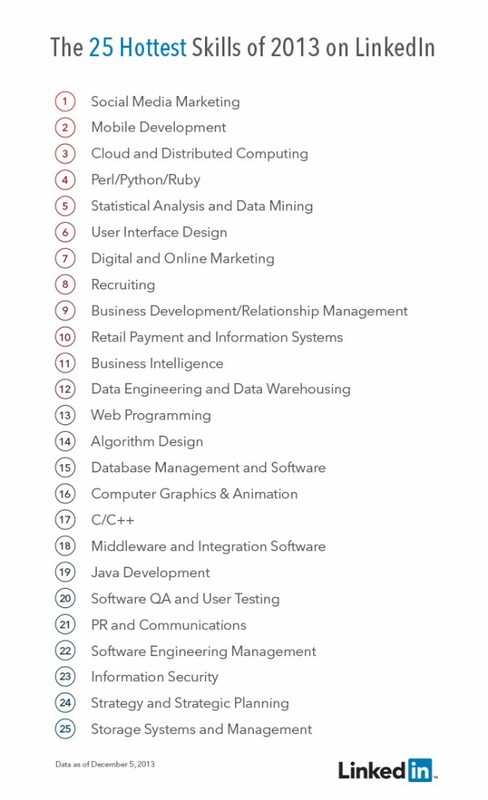 Of particular interest is the fact that 21 out of 25 (84%) of the hottest skills are digital or technically focussed. Interestingly, social media marketing skills ranked top of the list which ties in directly with the findings of our iSkills Digital Skills survey to be released in February this year. It’s almost 2014. This shouldn’t come as a big surprise, but if it isn’t already painfully clear why Science, Technology, Engineering, and Math (STEM) education is a top priority for many of the world’s governments, now you know. The results of the survey can be viewed below.